Today, a salad. Because in exactly one week I will be 28 years old and, on a day like that, salad is not going to cut it. On that particular and quickly approaching day, some sort of chocolate/peanut butter/more chocolate monstrosity will likely be in order, but today? Today we will stick with this simple and lovely, bright and mischievous salad. We’re only 27, after all. Your eyes will widen and your jaw, it’ll slack. That third pepper will be SPICY. It will slap you in the face with spice, firstly because it’s just plain spicy, but secondly because you hadn’t expected it to be so. Mischief! Wonderment! Pepper roulette! It’s sort of fun, really. 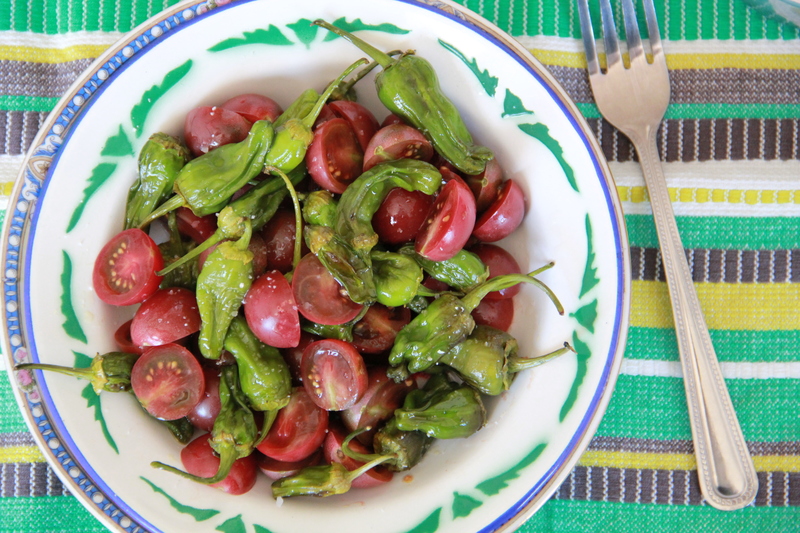 This time of year, late summer, Padron peppers contain more capsaicin than in June or July (now, about 1 in 5 is spicy, says my farmer’s market vendor) a phenomenon which makes for one interesting salad, no? So let’s roast some Padrons with olive oil and salt, and then pair them with fresh, cooling tomatoes and a squeeze of lemon. We’ll get a good balance of sweet and spice, salt and citrus and, most importantly, it will be a salad that’s fun to eat. Exciting, even. I mean, we’re 27 years old. Next week we’ll be 28. Let’s get our kicks while we still can, eh? 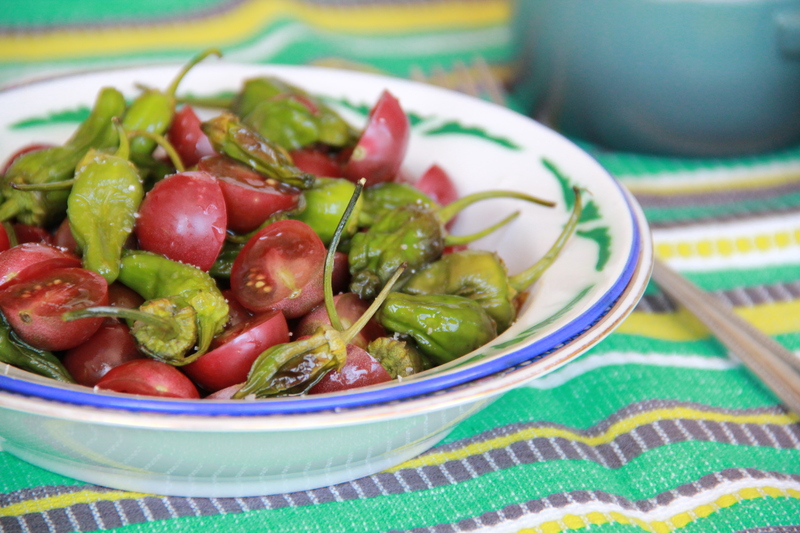 You should be able to find Padron peppers at the farmer’s markets this time of year. If you have trouble finding Padrons, look for their Japanese counterparts, called Shishito peppers. Heat the oven to 450 degrees F. Line a sheet pan with tin foil. Arrange the padrons on the sheet pan and drizzle with olive oil, to lightly coat. Sprinkle a pinch of salt atop peppers. Roast peppers for 5-7 minutes, shaking the pan about halfway through, until they’re charred in spots (they should still be a bit crisp — don’t let them cook so long that they get mushy). 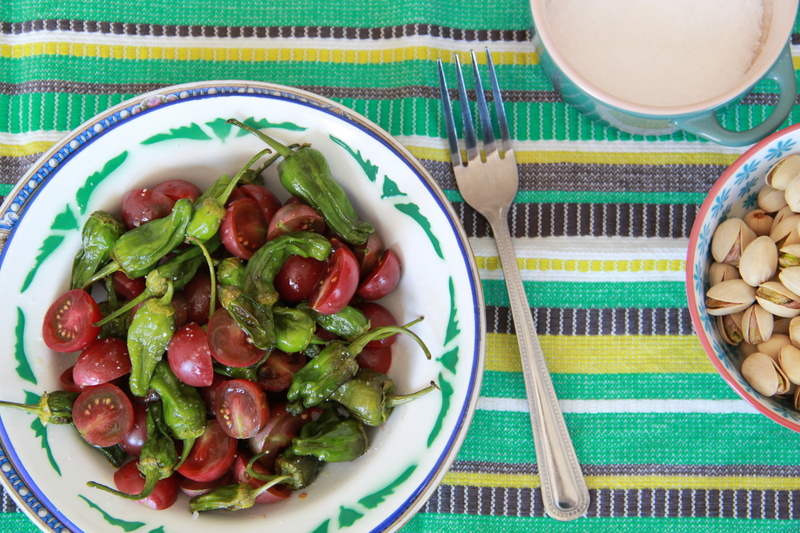 While padrons are roasting, slice cherry tomatoes in half, and place them in a medium sized bowl. Once padrons have cooled slightly, toss them on top of the cherry tomatoes. Squeeze the lemon juice over the salad, and season to taste with a bit more salt. Toss gently and serve! Serves 1 or 2, and is especially good with a few slices of thick bread and soft cheese. This salad looks great! I’ve had a similar appetizer at a restaurant, and it’s fun trying to find the spicy one.